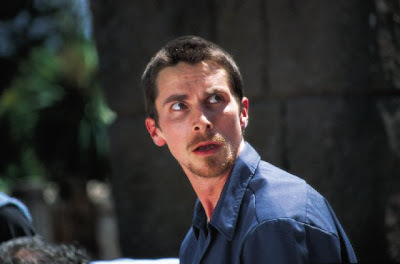 All Trevor Reznik (Christian Bale) wants to do is sleep. Having been plagued with horrific insomnia for a year—although told much like Edward Norton’s main character in David Fincher’s Fight Club that the loss of sleep won’t cause him death—Reznik is a walking zombie. Moving in that endless state which finds everyday bleeding into the next one, Reznik fears his eyes have begun to play tricks on him as they’re understandably unable focus or adjust to light and dark that’s enhanced by director Brad Anderson’s bleak visual design. And by bleaching out the color on the film print the way that the obsessive compulsive machine shop worker Reznik endlessly washes his hands and minimalist apartment with bleach augments screenwriter Scott Kosar’s incredibly ambitious symbolism filled screenplay to masterfully eerie effect. 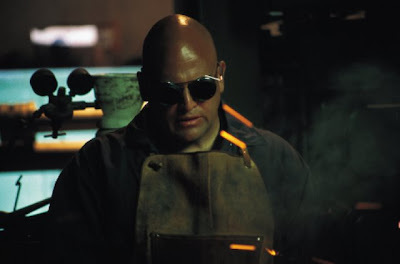 On the surface, there's initially Reznik’s name which is indicative of “butcher" (its meaning in Czech) which adds yet another subtext to the character’s position working in a machine shop where his fatigue results in a near fatal accident that costs an employee an arm. And of course, when you add Trevor to Reznik in Kosar's homage to Nine Inch Nails musician Trent Reznor, you know you're dealing with something instantly off center. Yet, tactfully Anderson avoided a particular heavy metal style or anything too overt in his execution of Kosar’s work that from the first page and/or frame easily hearkens to the obvious influences of Kafka, Dosteovsky, Freud, and existentialism. 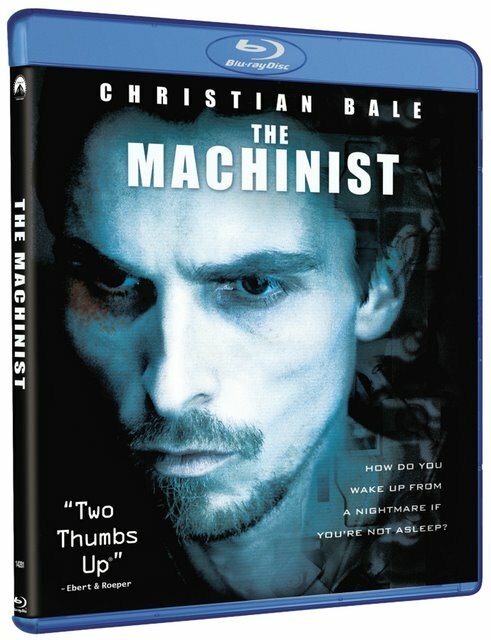 And once again, Bale loses himself in the production dropping a frightening sixty-three pounds to play the emaciated visibly skeletal haunted worker who plies his trade in an anonymous factory called National. However, there’s much about Reznik we don’t quite understand--especially considering the structurally issue that the quiet and damn near comatose character interacts sincerely with only two people throughout including Jennifer Jason Leigh’s concerned, compassionate call girl Stevie and Aitana Sanchez-Gijon’s sympathetic airport diner waitress. Despite this, we as well as Reznik are quick to understand that there’s much more to his insomnia and rapid weight loss than he realizes. Dropping endless red herrings and-- filled with dialogue, symbols, and elements that don’t fully become welded together until the devastating conclusion that answers our questions in a sequence of pure wonder—it’s a tough film to view to say the least but one that necessitates a second viewing soon after its finished. As, just like a nightmare—the kind most of us have while we’re asleep but Reznik has when he’s awake—we’re not sure who or what is lurking around each corner as Reznik’s paranoia increases when he meets a mysterious new coworker Ivan (John Sharian) who behaves strangely, seemingly follows Reznik, yet is also one no one else in the film acknowledges. 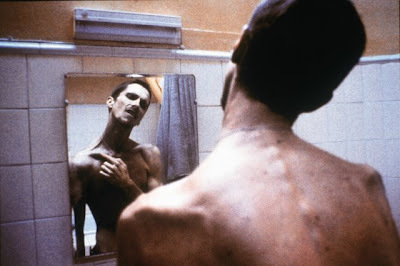 Not quite film noir and not quite Hitchcockian although elements of the nicely balanced Roque Banos theremin-heavy score seem like they would’ve been a natural choice made by the master of suspense, The Machinist nonetheless manages to immerse you completely into its macabre labyrinth of mania. No-- maddeningly and making it all the more a work of pure intellectual wonder-- it never lets us in on what exactly it is that the employees make in that peculiar machine shop let alone the city in which it takes place. 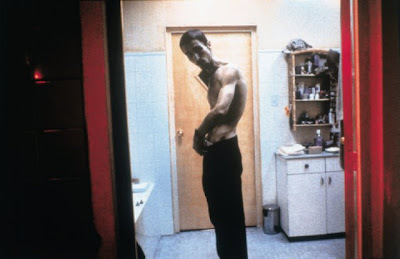 For although it certainly seems like its Los Angeles—The Machinist was filmed in Barcelona out of necessity (as no American company would back the strange film) and made to appear like a generic metropolis. With a distinct visual style—Anderson’s movie is increasingly striking on Blu-ray as that curious work that seems to have adopted the same Spanish signatures of directors working throughout Latin American cinema in crafting a highly literary and worthwhile urban dreamscape of existential hell. 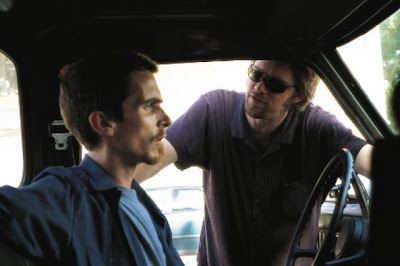 In a transfer filled with crisp precision, in my most recent viewing of The Machinist, I was immediately aware of the astute choices made throughout that's been enhanced in high definition from the noticeably bleached out color scheme and bravery in only using sound when absolutely necessary whether it’s to heighten a key line that will double back or the sound of a car or clock that fits into the finale. 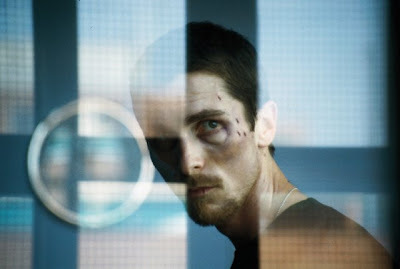 Containing Anderson’s directorial commentary track as well as deleted scenes, the theatrical trailer, the Blu-ray also offers the standard definition featurette The Machinist: Breaking the Rules in which Bale admits that despite others reluctance or question as to just what the hell the movie was about, he committed to the vision, knowing it was the type of movie he’d want to see. However, it also luckily surpasses some of the other recent studio offerings by delivering two worthwhile extras into elevated to HD including Manifesting the Machinist which chronicles the origin of Kosar’s story conceived while a student at a UCLA evening class as a horrific version of The Odyssey as well as the fight for financing and interest and my personal favorite The Machinist: Hiding in Plain Sight which introduces you to all of the symbolism used throughout from the visuals to the dialogue. Of course, it’s this type of “cheat sheet” extra that devotees will want to jump to first but as Anderson smartly reveals—although of course those who’ve seen the film realize that the puzzle is finally solved by the closing credits in regards to just what’s happening to the sleep deprived Reznik—the film manages to hold our interest on a far eerier level by ensuring that not everything is presented as a final, “cut and dried" a.k.a. "here’s how it all happened" conclusion. Challenging and ingenious, moving well past the popular gimmicks of other twist ending, “can we trust our narrator?” pieces that swarmed into theatres following Singer’s Usual Suspects and Shyamalan’s Sixth Sense up through Bale’s Batman Begins director Christopher Nolan’s Memento and more—The Machinist still holds up well as the type of film that does indeed work like a Kafka or even Stranger like Camus novella. Invading the comfort zone of your mind for one hundred and four minutes, you’ll be surprised just how long The Machinist lingers there afterward… much like a good book or that type of dream you have that you can’t quite recall but know deep down felt more like a nightmare even if you can't explain it.